CIA intelligence officer, Titus Ray, is back in Book 2 of the Titus Ray Thriller Series written by Luana Ehrlich. 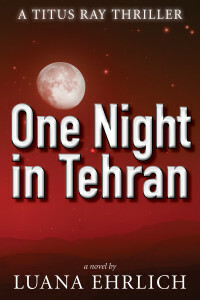 The first book, One Night in Tehran, was published in August 2014 and has received over 300 five-star reviews on Amazon. This new Christian thriller series introduced readers to Titus Ray, a veteran covert operative who is brought to faith in Christ by a group of Iranian Christians. In One Night in Tehran, Titus returns to the States from Iran and learns he’s been targeted by a Hezbollah assassin. After a disagreement with his boss, he’s put on medical leave and travels to Oklahoma, where he meets an Iranian couple, who may have ties to the man who’s trying to kill him. When he finds himself in the middle of a murder investigation, he must decide if Nikki Saxon, a beautiful local detective, can be trusted with his secrets. 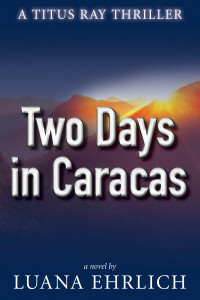 Two Days in Caracas, Book 2 in the series, begins with Titus on the hunt for Hezbollah assassin, Ahmed Al-Amin. As the story unfolds, Titus travels from Costa Rica to Caracas, Venezuela in an effort to stop Ahmed Al-Amin from assassinating a high-profile government official. Along the way, a family crisis jeopardizes his mission, and an Agency division head threatens to destroy his career. As the danger mounts, he’s forced to partner with an untested operative to complete the mission and bring Ahmed to justice. Both One Night in Tehran and Two Days in Caracas have book trailers available on You Tube. For a visual look at the plotline of Book 1, watch the trailer here One Night in Tehran. The second book in the series is available here Two Days in Caracas. Titus Ray Thrillers can be ordered on Amazon and at Barnes and Noble. Occasionally, she reports on the experiences of newly converted Christians for Baptist Press, a national news service for Baptists. She was also a weekly columnist for The Indiana Baptist, where she told the stories of ordinary people who became followers of Christ. Luana is a member of the American Christian Fiction Writers. 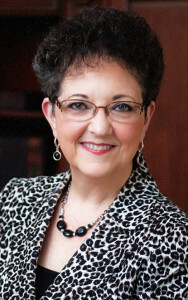 For her personal website, visit www.LuanaEhrlich.com. Luana also has a dedicated website devoted to her thrillers at www.TitusRayThrillers.com. Her weekly blog is posted on His Glory My Joy and she posts devotional quote boxes on the Blessing Box Blogger.